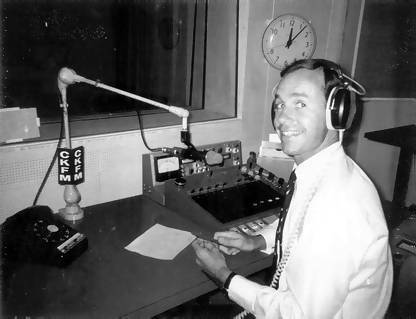 On this page Keith recalls the early days of Radios Caroline and Atlanta and his time with Radio 390 while simultaneously working for a regional commercial TV company. “Although Simon's was the first voice to be heard on Radio Caroline, he didn’t present the first show. That honour went to Chris Moore. Well, Chris was the Programme Controller. 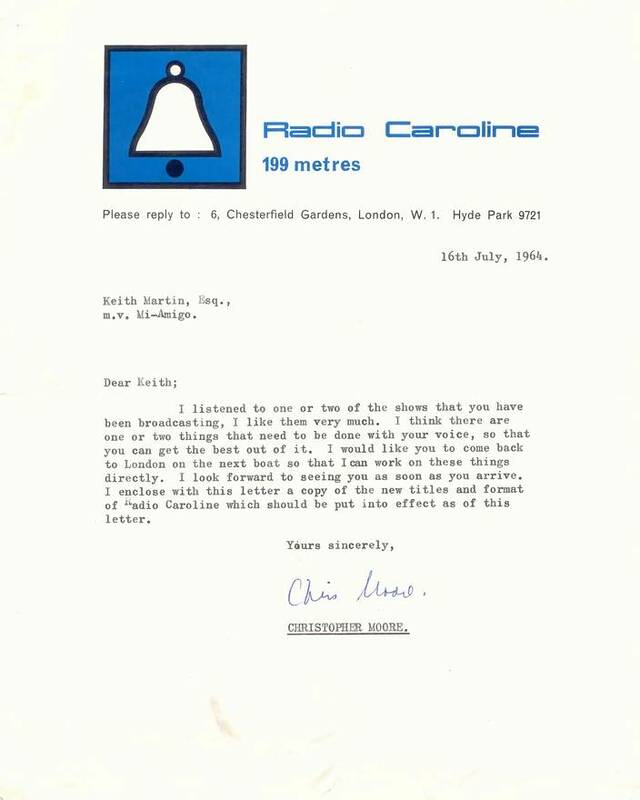 A few weeks later I too was to be announcing ‘This is Radio Caroline, your all day music station’. Yes, I'd given up my secure day job for life all at sea. Just what was I letting myself in for? The letter from Chris Moore, kindly provided by Keith Martin. Click to magnify. The new station format that Chris enclosed with this letter is here. I was with Allan Crawford when he was very anxious to get some kind of foothold in the Isle of Man so he sent two people to the island to investigate. Allan was striving to get in there with his ‘proposals’ before anyone else. As I recall, the engineer who put the Dean Street studio together went with Paul Hollingdale to the IoM to explore. To put some kind of date on this, Manx Radio started broadcasting on 29 June 1964. Without doubt it was the retired BBC engineer - the one who kept the transmitters on board the Mi Amigo modulating at 40% because that was BBC practice and who always referred to the bowels of the ship, where they were based, as ‘the Transmitter Hall’. Later, when far younger lads took over the transmitter, they whacked up the modulation to 100%. There was much distortion but the sound was much louder so who cared! I was sharing some deejay duties with Colin Nicol when, via the Offshore tender, I was sent a note from Chris Moore requesting that I pop into his office when next ashore because ‘there are one or two things that need to be done with your voice.’ All these years later, after a career in broadcasting with the BBC, ITV and BFBS amongst many others, I'm still awaiting his advice, if that was what he was really aiming at! Has anyone exposed the conditions on board the Mi Amigo? They must have, so, I don't have to mention that there was an insufficient number of cabins with bunk beds so the ship, at certain times, was short on sleeping quarters. But who was it who pulled the short straw? I was allocated the ship's hold. Its location was at the fore, the sharp end - the front part. I entered my space through a heavy trap door and then took careful steps down a vertical ladder. There was no port-hole there but I always had company. A near potent combination of engine oils various and the smell of paint. To keep the Dutch crew forever busy, boat painting was a must. In our mess room, our multi-use common room, various group activities took place. The black and white television demanded aerial alignment duty because as the boat turned with the tide the TV aerial would end up pointing in the wrong direction for the reception of such memorable shows as Discs-a-Go-Go and Crossroads. When I could, I ate. I was not a good sailor. Connoisseurs of cooking should note that it appears that Dutch recipes demand copious sprinklings of nutmeg. We also drank the drink, talked the talk in our Mess. On more than one occasion demands for a pay increase were heatedly discussed. At times there was certainly a strong smell of rebellion - well, we were pirates after all and such talk should not have come as a surprise to anyone! Later I presented my proposal (and I still have a copy) to Crawford - one week on board, one week off. At that time the rota was two weeks on, then a week on dry land. Let me tell you more. At that time, our weekly pay package was £15. It was agreed that an increase was to be demanded to twenty - £1,000 a year - a lot of money for the 1960s! Mr. Scanlon (web-master's note: should this be Scadden? ), our secret wireless contact in Frinton must have been alerted ... but I can't now remember what I did - if anything, but it could have turned nasty, very nasty indeed. Another hot topic and perhaps the most important for us all was on a very delicate subject, the no-no subject of male potency or the possible lack of it! A rumour was rife at the time. It was this: the Radio Caroline transmitter was so close and we were so near for so long that the signal was burning into our very own private parts. We were slowly becoming sterile. This really put the frighteners up everybody. We must get ashore immediately and do the test - whatever way was deemed appropriate. The rumour was just a rumour. For the record, my very own Caroline is now a grandmother and so is Peter, Paul and Mary. But enough of such very personal stuff. For, like you, I do have a private life. I must now return to my on board ‘cabin’ at the pointed end of the boat. It was a place with spare chains and store cupboards not forgetting those little extras - an extra strong smell of concentrated paint trapped in my fully unventilated space with its special entrance through a trap-door then down a rusty vertical ladder and so to bed. The slightest boat movement, brought about by tides and wind strength, was amplified in my exclusive sharp end sleeping quarters. Apart from that, everything was fine, just fine and as this was my leg-up and over for my entry into full-time show business, that was the way it had to be! With limited space on board and the lack of privacy, emotions could run high on the Mi Amigo. There was that particular incident concerning Simon and I, when he (not I, never me!) began shouting at me after I'd remonstrated about the ditching of the discs out of the port-hole into the North Sea. It became a titan match that breakfast 6am morn. Simon was late on air that morning. Listeners may have wondered about the uninterrupted sound of music for half an hour. During the shouting match my manual dexterity was at its peak as I continued spinning discs - faultlessly and seamlessly of course. The show must go on! The tender, Offshore I, in calm seas alongside the mv Mi Amigo. Photo kindly provided by Keith Martin. Click to magnify. At one stage Caroline South upped anchor and cruised to a point closer to the Thames Estuary - at the Nore - during the time I was aboard. We stayed there long enough to prove that the radio signal was mightily improved but the sea was too shallow. The boat rocked and rolled around far too much for everyone on board. The Caroline South reception in London may have been so fantastic that listeners could hear the record scratches, but the seasickness on board was too great for any kind of show business. I recall Allan Crawford sending a memo to each of those on board thanking us for our efforts ‘during the past few days’. If only I'd kept my Crawford memo, I would be able to give more precise details, but I went off to Canada in 1969 and before I departed must have disposed of lots of now-useful papers. If only I'd known. I was never a sailor and couldn't keep anything down. And I couldn't get myself up in the morning. No-one, but no-one could have been more relieved than me to return to the deep waters off Frinton. I was already a bag of bones before the moving event and must have looked like death after it. This move must have taken place around October '64 prompted either, please forgive the puff, by a remark I'd made to Crawford that the signal would be much louder if it went straight up the Thames, or perhaps because the forts (in direct line) could be heard so well in London, even with their lower power transmitters. Or did Crawford get wind that Radio London was on the horizon? In November '64 I left the ship and worked for the station on land. My departure from the Mi Amigo meant Simon Dee would return to the ship. Simon and I met on the Caroline House stairs, me going down and he moving up. He greeted me, through gritted teeth, with ‘I believe I have to thank you for my return’. During my time on shore, my duties included commercial transfers in the basement studios of Caroline House, with the ding-ding bell at the head of every single advert. Sometimes it wowed in because we had to do so many unbalanced transfers from small tape spools to big NAB reels for playing on the ships. 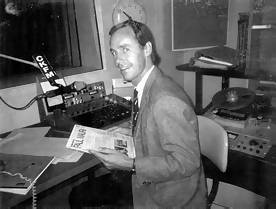 Michael Parkin, who was responsible for advertising at the time, wanted the station to sound busy. 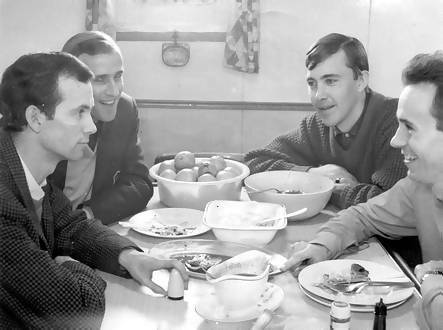 Keith, far right, enjoying a meal on the mv Mi Amigo. Bryan Vaughan is sitting next to him. Arthur Pelteret, who looked after commercial traffic, is on the far left. Photo kindly provided by Keith Martin. Click to magnify. At home I made tapes of Caroline broadcasts for Michael, when advertising agents were demanding ‘make good’ spots because their ads sounded ‘woolly’. After investigations I found the reason. The Caroline House Leevers-Rich machine tape heads were out of alignment with the TEAC playback equipment on the ships. This prompted the purchase of a professional test alignment tape, so tape heads were corrected. I made those off-air recordings for Michael at my Chiswick home listening post with its Blaupunkt radio and Ferrograph tape recorder - but what happened to them? There are lots of other anoraks - sorry enthusiasts - out there who must have other tapes of the early pirate broadcasts still stored away somewhere. After working at Caroline House for some months - late '64 to early '65 - I was asked if I would return to the ship over the Easter period. My ego took over and so once again, I was bobbing about on the North Sea. But it was to get rough, very rough. So rough that when the tender turned up to deliver and collect DJs, I had to stay on board with Bryan Vaughan and another to keep the records spinning and the pre-recorded tapes turning, during those gale-force times. As far as I was concerned, it was a gale force ten! There was no gangplank to walk between ship and tender, we had to jump from one to the other and I ‘chickened out’ under such terrible conditions, so stayed aboard. Sick to death as I was, I certainly did not fancy being crushed to death. Weather records will prove those rough conditions for that Easter of 1965. It was some time, well after that Easter, that I became a ‘Caroline cast-off’, cast off for good as a paid-up member of the Caroline crew. That would have been when Ronan took control of both the north and south ships. But that wasn't the end of my pirate days, for Radio 390 was still to come: a new episode and new identity as ‘Gary Courtney’. 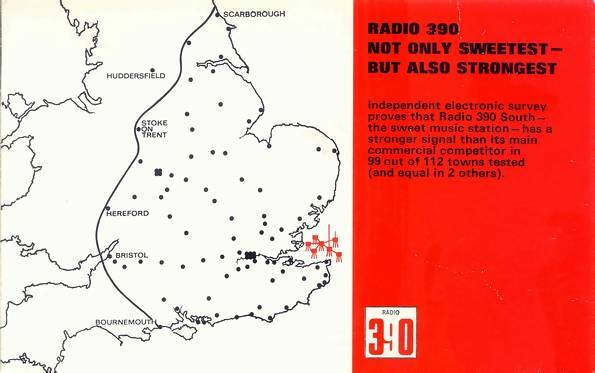 The cover of a leaflet, issued by Radio 390, giving signal strength measurements for various locations in the south-east of England, to prove that 390 had the strongest signal of all the pirates. Courtesy of Keith Martin. Click to magnify. Radio 390 did neither rock nor roll - it was housed on one of the forts in the Thames Estuary. If only John Thompson had taken on board what I'd mentioned some years earlier during the Slough days. They had been commandeered first by other pirates and then 390 took over. The actual wavelength of Radio 390 was 388 metres, an allocated agreed frequency for Swedish Radio Stockholm. A frequency already ear-marked by yours truly. It was Mike Raven, the ex-Radio Atlanta Rhythm and Blues merchant, who first made contact with an offer that was difficult to refuse. It had to be low-key at that time but, trust me, I'm a pirate. The problem was that I'd already accepted a job on land (and I would like to add a commercial break for myself - that this pirate was the first to land a broadcasting job on terra firma). It was with ABC Television. But some months later, I was thrilled to be turning the pages of ‘Eve the Womans Magazine of the Air’ too. But there was a commitment made to ABC. The condition? A name change. So, during the drive down to the Whitstable quay, a discussion took place - what to call me, what name would I like? The main record librarian (who also ran a ladies hairdressing salon on London's Fulham Road) ventured to mention Gary Courtney. I had received the calling and I was reborn. Keith Martin was to be Gary Courtney of Radio 390! The trip from the quay to the forts took time, a very long time on a small fishing boat. Eventually an open hoist lifted me up, up and away onto the gangways high, high above the fast flowing Thames waters. The tower never swayed but occasionally they shivered a little in high wind. During my extensive tour of the facilities I was introduced to the original electric generators, first installed during WW2 - obviously British workmanship at its very best and so had stood the test of time. The RCA 10kW transmitter, generating, it was said, an ERP of 35kW - really? I was also amazed at the size. It was so small, about a quarter the size of the Continentals on the ships - the size of a modern day large domestic fridge. When shown the sleeping quarters, boarding school days flashed through my mind. The room was like dormitory - a school dorm with its row of beds. The Radio 390 studio was basic and functioned well. There was a gong type contraption that had to be struck before the reading of a live commercial - no hard sell, just talk to me. Who ever decided to use the gong must have been an avid listener, just like me, to mainland European commercial radio. Gongs were not only heard on Radio Luxembourg, but via Europe Number 1, Radio Monte Carlo and Radio Andorra. With my introduction and induction over I was very soon turning the pages for Eve and her Masters of the Organ, Music from the Shows, Moonmice and Melody Fair as well as reading record request cards From Me To You. All announcers, as we were called - and that was the way we were told to sound - were kept very busy as we rushed back and forth to the record library to pick up yet another batch of 45s and LPs in between the 15 minute programmes. 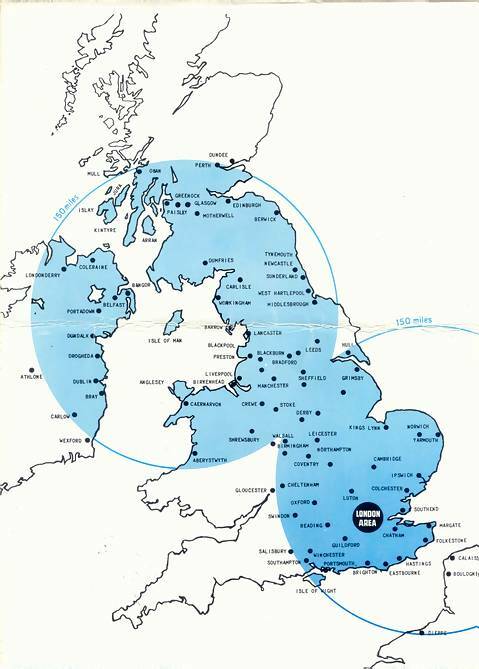 Radio Caroline's coverage, following the merger. Scanned from an advertising rate card, courtesy of Keith Martin. Click to magnify. Further reflections: Why did Crawford allow his own Radio Atlanta transmitter crystal, an essential little gem that ensures that the transmitter broadcasts on a particular frequency - why did Allan allow it to be passed to the competitor (as referred to in this letter)? If he had refused their request then Radio Atlanta would have been first on air. So the Caroline engineers got hold of that essential crystal, the genie that brought a radio revolution to the doors of the BBC. In the annuals of all time it was to be Radio Caroline that was allowed, through Crawford's naivety, to be first on air, broadcasting music all day long, the station that was to change the sound of British broadcasting forever. My observation at that time was, and perhaps time has proven, that Allan Crawford's aim was to establish a radio ship within the framework of British law but Ronan O'Rahilly became frustrated with the slow, plodding progress of Project Atlanta and maybe always intended to be first anyway. So Ronan decided to steam ahead and begin broadcasts - and leave it to the British Government officials to announce what was legal and illegal, then adapting the operation of the station to fit that legal framework. 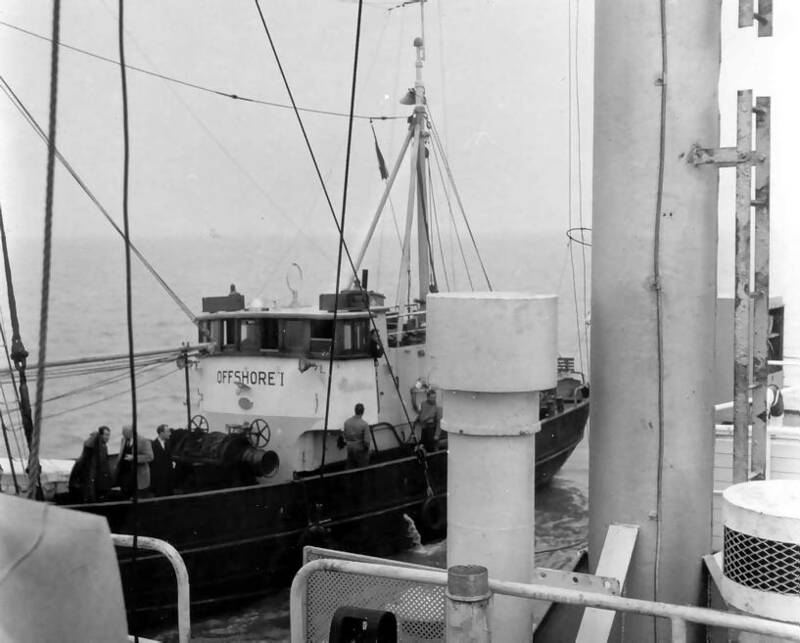 Then came the Marine (Offshore) Offences Bill of 1966, later the Act that outlawed or at the very least made it very difficult to service and to advertise from radio stations at sea. After that came the huge increase in legal land-based stations we know today. I was the only ex-pirate to have joined the Local Radio Association, the political pressure group that was instrumental in bringing commercial radio onto dry land in the United Kingdom - and how very chuffed I was that I managed to get a clause added to that new Broadcasting Act. After a career in announcing and presentation on ITV, Channel 4, the BBC, BFBS, radio in Canada, pirate Radios Atlanta, Caroline and 390, plus many commercials for cinema, radio and television, Keith continues conducting his pioneering television presentation and media courses. He will remain an anorak forever - and we are very grateful to him for sharing his memories and memorabilia here. Thanks also to Colin Nicol for his assistance. For more of Keith's fantastic collection of pirate memorabilia, see here. Local paper press cutting, courtesy of Keith Martin.